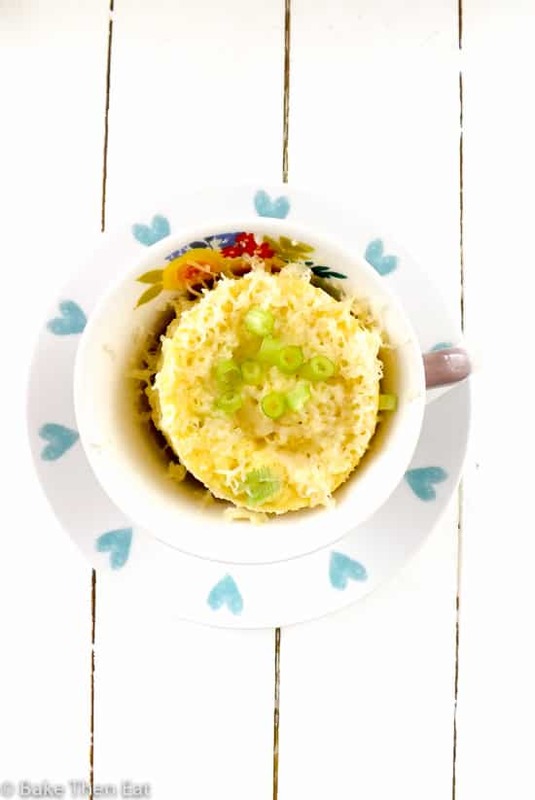 Its recipe 3 of my ‘7 breakfasts for 7 days’ recipe challenge and today I am bringing you something a little different, Gluten Free Microwaved Cheesy Onion Breakfast Savoury. I know I hear you, savoury for breakfast? Yep it’s a little weird for me too. But part of my challenge was to come up with a couple of savoury recipes as well. I think it’s more of a mainland European thing than a British thing but I am willing to give most things a go. Really there is no reason why we don’t enjoy savoury foods more often for breakfast, when it comes to a lazy day breakfast / brunch we Brits are the first to dive into a super unhealthy plate of fried food. (Well technically I don’t being vegetarian, everything is grilled and virtually fat free but I think you get the idea!) And this is where Arla come in, they want to help improve our breakfast choices. Because I was so limited on time, I knew I would be unable to get any pots and pans out so I went to one of my favourite treats this year and that is mug cakes. All of the ones I make are Vegan and Gluten Free but a major problem being they are sweet delectable treats. Not savoury breakfast foods. Although maybe you could get away with this banana bread one as a breakfast food in a pinch. Anyway…… so after a few failed attempts of weird sweet savoury things I decided that I was going to have to ditch the idea of keeping this vegan, still vegetarian of course, but not vegan this time. I was going to need to use eggs! So after many more weird attempts at something that we shall never speak of again, I hit the jackpot! Now the reason I went for calling this dish gluten free cheesy breakfast savoury apart from the obvious fact it gluten free, savoury and a breakfast food is because its somewhere smack bang in the middle of a muffin and an omelette. It’s neither one nor the other maybe we could call this a mufflette! Now that just sounds down right saucy….. Omefin? Doesn’t sound very appetising does it? So we shall just go with breakfast savoury, I think it’s safer that way. So what’s in this bad boy gluten free microwaved cheesy onion breakfast savoury anyway? For starters to flavour it I am using a nice amount of finely grated mature cheddar cheese and a spring onion. Along with some cheeky seasoning, salt, pepper and a pinch of sweet smoked paprika. To keep it gluten free I am using quinoa flour. It’s a great flour to use with a subtle nutty flavour. If being gluten free isn’t an issue then I imagine plain / all-purpose flour will work fine. But please be aware I haven’t tested this recipe using plain / all-purpose flour. 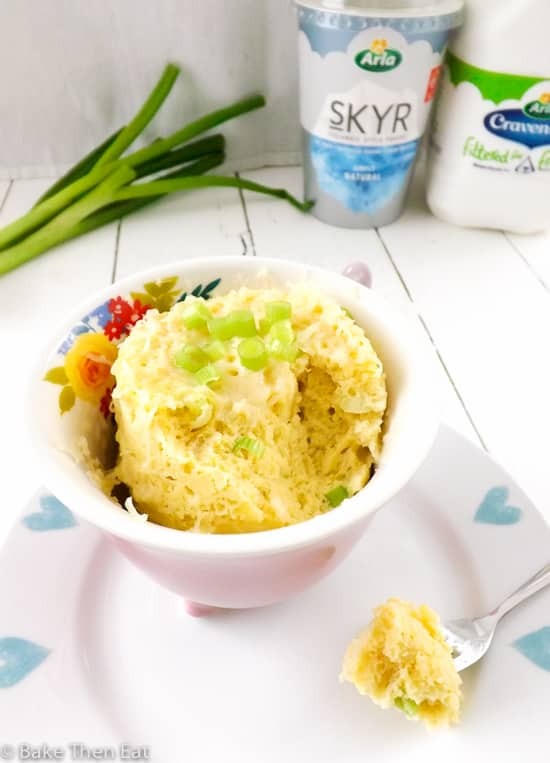 Along with the egg, I am also using Arla’s Skyr natural yogurt and their BoB milk for the dairy. Like all mug cakes / muffins / savouries all ingredients go into a large mug. Get mixed in the large mug then popped in the microwave until cooked then eaten and enjoyed. As an added bonus all the washing up you have is a spoon, fork and the mug that you mix, cook and eat out of, heaven! 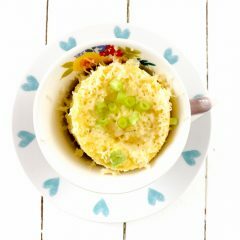 So there is no excuse not to try this fabulous gluten free microwaved cheesy onion breakfast savoury. Gluten Free Microwaved Cheesy Onion Breakfast Savoury is a cross between a muffin and an omelette. Packed full of cheesy goodness with a cheeky hint of onion. In a large microwavable mug crack the egg in it and lightly beat it with a fork. Add in the yogurt and milk and lightly beat again until incorporated. 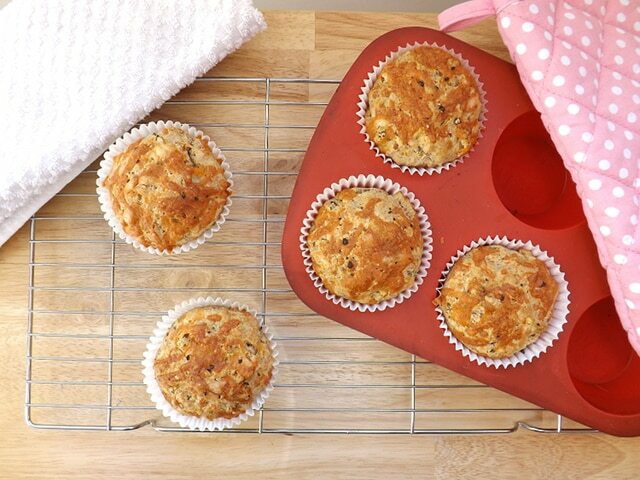 Mix in the flour, baking powder, cheddar cheese, spring onion salt & pepper and the sweet smoked paprika. Mix until everything is well incorporated. Place your mug in a microwave (I used an 800 Watt microwave) and cook on full power for 2 minutes. Check your breakfast savoury with a cake pick to make sure it's fully cooked. It should feel springy to the touch and be starting to pull away from the sides. If your pick does not come out clean give it a further 30 seconds and test again. Once happy, sprinkle the remaining tablespoon of cheese on top and serve immediately. This Gluten Free Microwaved Cheesy Onion Breakfast Savoury post is sponsored but I can assure you all opinions are my own and this is not a sales pitch and I am making no money from these posts. The ingredients were given to me to develop the recipes. Oh, this looks great! We have a bunch of onions from the garden right now so looks like I have our new breakfast! Thanks! Hi Pamela, you’ll love this I am sure! 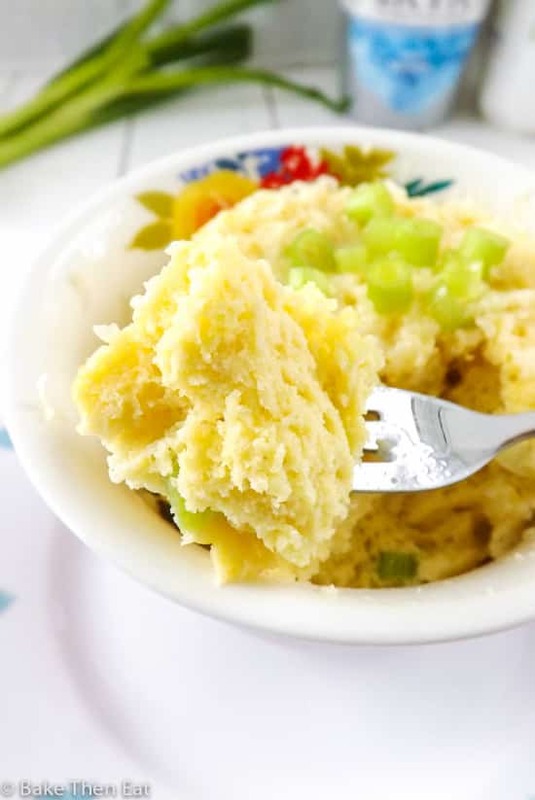 This recipes looks delicious and I love the fact it’s gluten free and you can have your eggs with it too! What a brilliantly easy breakfast! This sounds great. I really want to try this at my home. Thanks for the lovely recipe. o I love that fluffy and moist texture. A great one to start the day, Emma.